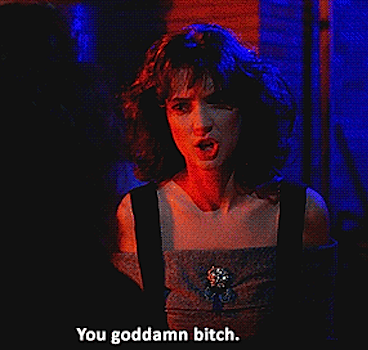 Winona Ryder isn’t that girl in class that raises her hand first. As far as celebrities go, she’s highly private and reclusive, especially in the years following Girl, Interrupted (1999) and her shoplifting trial (2002). Thankfully, the beloved icon who debuted in 1986’s Lucas opposite Corey Haim and Charlie Sheen, later blazing brooding witty trails with Beetlejuice, Mermaids and Reality Bites, has recently put herself in the public eye just a tiny bit more than we’re used to. In a brief Q&A with Parade, Ryder admitted to watching and reciting dialogue from her old movies when they’re on TV. I heard Heathers was re-made as a stage musical and may come back as a TV show on Bravo, which I hope doesn’t pan out. You know there isn’t a director or showrunner in this world that could pull off a remake because they wouldn’t have the balls [or be allowed] to make light of heavy subject matter like bulimia, homophobia, and guns and bombs at school. There’s also no way they’d be able to do the original cast justice. Wino forever. I thought i was the only one who knoew of this movie lol! it is very funny..